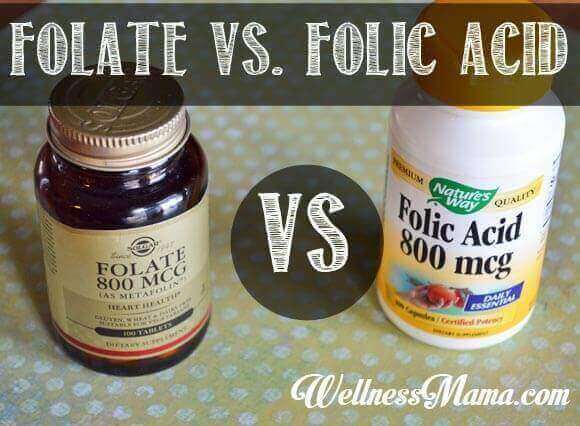 I’ve gotten several questions lately about folate and folic acid, especially during pregnancy. These two are often used interchangeably and even many doctors will not be able to tell you the difference if you ask. The body needs this important nutrient, especially during pregnancy and folate is the natural form of this nutrient found in foods. You’ll often hear that folic acid is simply the supplemental form, but there are some key differences. Recent research is supporting the fact that folic acid should be avoided and the natural form should be preferred. What’s the Difference Between Folic Acid & Folate? The natural form can enter the main folate metabolic cycle is tetrahydrofolate (THF). (2) Unlike natural folates, which are metabolized to THF in the mucosa of the small intestine, folic acid undergoes initial reduction and methylation in the liver, where conversion to the THF form requires dihydrofolate reductase. 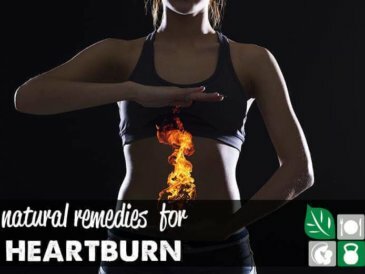 The low activity of this enzyme in the human liver, combined with a high intake of folic acid, may result in unnatural levels of unmetabolized folic acid entering the systemic circulation. 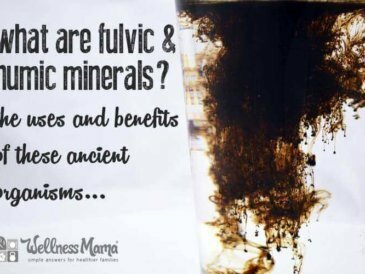 Several studies have reported the presence of unmetabolized folic acid in the blood following the consumption of folic acid supplements or fortified foods. (3) Human exposure to folic acid was non-existent until its chemical synthesis in 1943, and was introduced as a mandatory food fortification in 1998. (4) Food fortification was deemed mandatory due to overwhelming evidence for the protective effect of folic acid supplementation before conception and during early pregnancy on the development of neural tube defects (NTD) in newborns. I’d recommend reading his full article, but research is supporting the idea that too much synthetic folic acid can increase risk of some types of cancers (source) and it may not even be as effective in preventing neural tube defects. “It is necessary during rapid cell division and growth. In fact, pregnancy is known to actually double the need of dietary folates. Folate is found naturally in foods like liver and spinach. 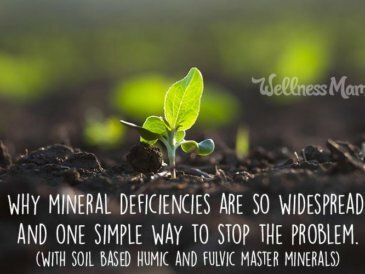 It is also possible to find a natural supplemental form that can be taken in place of folic acid. Though the recommendation for pregnancy is 400-600mcg of folate/folic acid, this is the minimal amount needed to prevent birth defects. 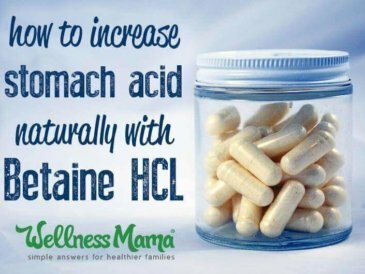 When using folate instead of folic acid (thus removing the added risks to mom with the synthetic form), it is often advisable to take more than the minimum. As always, check with a doctor or midwife before taking or changing anything, especially during pregnancy, but do your research on this one! What I do: Before and during pregnancy, I take 800-1200 mcg of folate. I have used Pure Encapsulations Folate (slightly higher quality) and Solgar Folate (less expensive) with good results. 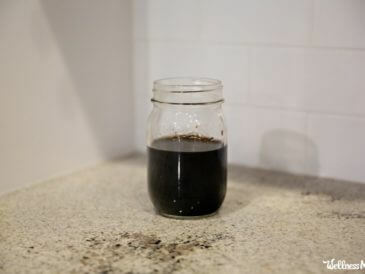 The one downside is that it isn’t as easily absorbed, so it is often necessary to take more and to get it from real food sources. I also eat liver at least once a week during pregnancy. UPDATE: I now take this prenatal instead which contains adequate levels. Do you take folic acid or folate during pregnancy? How do you make sure to get enough? Share below! 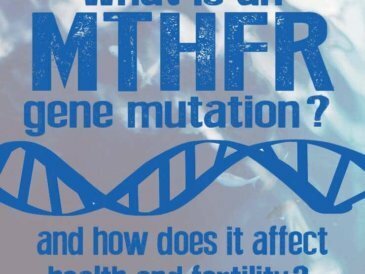 What Is a MTHFR Mutation?